Sir Isaac Newton PRS MP; 25 December 1642 – 20 March 1726/7; was an English physicist and mathematician. He is famous for his work on the laws of motion, optics, gravity, and calculus. In 1687, Newton published a book called the Philosophiae Naturalis Principia Mathematica in which he presents his theory of universal gravitation and three laws of motion. Newton built the first practical reflecting telescope in 1668; he also developed a theory of light based on the observation that a prism decomposes white light into the colours of the rainbow. Newton also shares credit with Gottfried Leibniz for the development of calculus. Newton's ideas on light, motion, and gravity dominated physics for the next three centuries, until modified by Albert Einstein's theory of relativity. Isaac Newton was born on 25 December 1642, in a manor house in Lincolnshire, England. His father died three months before his birth. When Isaac was three his mother remarried, and Isaac remained with his grandmother. He was not interested in the family farm, so he was sent to the University of Cambridge to study. It is sometimes told that Isaac Newton was reading a book under a tree when an apple from the tree fell on his head. This led to his calculations of gravity. Newton explained the workings of the universe through mathematics. He described laws of motion and gravitation. These laws are math formulas that explain how objects move when a force acts on them. Isaac published his most famous book, Principia, in 1687 while he was a mathematics professor at Trinity College, Cambridge. In the Principia, Isaac explained three basic laws that govern the way objects move. He then described his idea, or theory, about gravity. Gravity is the force that causes things to fall down. If a pencil fell off a desk, it will land on the floor, not the ceiling. In his book Isaac also used his laws to show that the planets revolve around the suns in orbits that are oval, not round. Following are the three laws of motion. Newton's first law of motion states is that an object that is not being pushed or pulled by some force will stay still, or will keep moving in a straight line at a steady speed. It is easy to understand that a rocket will not move unless something pushes or pulls it. It is harder to understand that an object will continue to move without help. Think of the rocket again. If someone is flying a rocket and jumps off before the rocket is stopped, what happens? The rocket continues on until it goes into space. The tendency of an object to remain still, or keep moving in a straight line at a steady speed is called inertia. The second law explains how a force acts on an object. An object accelerates in the direction the force is moving it. If someone gets on a bicycle and pushes the pedals forward the bicycle will begin to move. If someone gives the bicycle a push from behind, the bicycle will speed up. If the rider pushes back on the pedals the bicycle will slow down. If the rider turns the handlebars, the bicycle will change direction. The formula showing this law is F=m*a, or the force acting on an object is equal to mass times acceleration. The third law states that if an object is pushed or pulled, the object will be push or pull equally in the opposite direction. If someone lifts a heavy box, they use force to push it up. The box is heavy because it is producing an equal force downward on the lifter’s arms. The weight is transferred through the lifter’s legs to the floor. The floor presses upward with an equal force. If the floor pushed back with less force, the person lifting the box would fall through the floor. If it pushed back with more force the lifter would fly into the air. When most people think of Isaac Newton, they think of him sitting under an apple tree watching an apple fall. Some people even believe the apple fell onto his head. Newton understood that what makes things like apples fall to the ground is a specific kind of force — the force we call gravity. Newton thought that gravity was the force of attraction between two objects, such as an apple and the earth. He also thought that an object with more matter exerted the same force on smaller objects as they exerted on it. That meant that the large mass of the earth pulled objects toward it. That is why the apple fell down instead of up, and why people do not float in the air. Isaac Newton went on thinking about gravity. Before Newton, people thought that only objects near to the earth would fall down. But Newton thought that gravity should not just be limited to the earth and the objects on it. What if gravity went to the moon and beyond? Newton invented a formula for calculating the force of attraction between two bodies. He used it to calculate the force needed to keep the moon moving around the earth. Then he compared it with the force that made the apple fall downward. After allowing for the fact that the moon is much farther from the earth, and has a much greater mass, he discovered that the forces were the same. The moon is held in an orbit around earth by the pull of earth’s gravity. The formula invented by Newton is called the Law of Gravitation. Isaac Newton’s calculations changed the way people understood the universe. No one had been able to explain why the planets stayed in their orbits. What held them up? Less than 50 years before Isaac Newton was born it was thought that the planets were held in place by an invisible shield. Isaac proved that they were held in place by the sun’s gravity. He also showed that the force of gravity was affected by distance and by mass. He was not the first to understand that the orbit of a planet was not circular, but more elongated, like an oval. What he did was to explain how it worked. 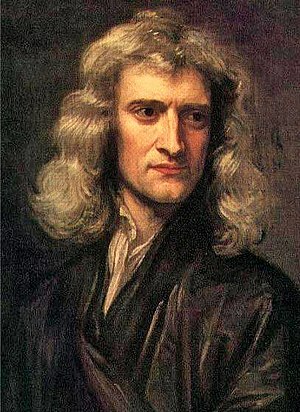 Sir Isaac Newton was the first to discover the laws of gravitation and the laws of motion. He also established a new field in mathematics known as calculus, though the German Gottfried Leibniz had developed the ideas at the same time. His work has greatly contributed in the areas of science and mathematics making him one of the most influential scientists in human history. The great physicist, Albert Einstein, thought that Newton's idea of gravity was not completely accurate. He corrected many of the things that Newton did. Isaac Newton died on 31 March 1727, in London, England. After his death, mercury was found in his hair. This may have meant that he had suffered from mercury poisoning. He is buried in Westminster Abbey. He set the stage for many famous physicists to come, such as Albert Einstein, James Chadwick, and Stephen Hawking. ↑ 2.0 2.1 This is the generally accepted manner of recording Newton's death date. Please do not change without discussion. Check Old Style and New Style dates for the background information. ↑ 3.0 3.1 3.2 3.3 3.4 Gay, Peter; Time-Life Books (1966). "The practical philosophers". Age of Enlightenment. Time. pp. 12, 18. ↑ "BBC - History - Historic figures: Isaac Newton (1643-1727)". bbc.co.uk. http://www.bbc.co.uk/history/historic_figures/newton_isaac.shtml. Retrieved 5 September 2010. ↑ "Newton, Isaac (1642–1727)". Eric Weisstein's World of Biography. http://scienceworld.wolfram.com/biography/Newton.html. Retrieved 30 August 2006. This page was last changed on 20 October 2017, at 09:08.